Nature fascinates me. This week’s challenge provided an opportunity to share two images that show just how intriguing nature can be. Hard to believe that the dragonfly evolves from this. You can see the hole (weakness) in the back of the exoskeleton where it made its push to flight. These delicate and mysterious creatures are always met with resounding cheers at the cottage when their short season begins … their preferred diet is mosquitos! This beauty must have been lulled by the morning sun, or perhaps it had just emerged from it’s former state pictured above. It rested on the railing right beside the screen door for over a minute. I was able to set up and take several shots before it flew away. OUTSTANDING PHOTO dear friend Cheryl… Smile! Wherever you are!!! Thank you, Saroj, for the comment and the smile. These are amazing photos Cheryl! Thanks for visiting my blog too 🙂 Happy weekend! Thanks, Gracie. Your Central London photos were impressive, particularly like the pov and dof for the ‘eye’. Happy weekend to you too! Thanks for stopping by and for the pingback. We are kindred spirits in the desire to write. I wish you success in that. Good morning, Mr. B. Hope you and your family had a wonder-filled weekend. Thanks for the pingback. Thanks for stopping by, MJ. Loved the corn maze, sunset shots. Never been through one, but I think your story has changed my mind … next year. Good Morning, Sony! Has anyone identified your mysterious plant yet? You might have to do another post when that happens … I’m sure I’m not alone in wondering. Thanks for the pingback. Really enjoyed the tour of your photo weblog! Colorado Sunrise in November is spectacular! Thanks for stopping by … and the pingback. Wow! The way you captured such beauty is amazing… I can only hope to see many dragonflies during their short season. It can be hard to believe that such a wonderful thing can emerge from something so dull. But in it’s own way, the previous form is quite beautiful. This is just one of Nature’s ways of making life that bit better. Well said, Emily! Thanks for stopping by. Beautiful and amazing transformation. I’m always fascinated by the dragonfly. I used to catch some when I was a kid. During summer when its near rice harvest season, hundreds of them would gracefully hover above the field. Thank you for sharing a wonderful post. Stay blessed my friend. What spectacular sight that must have been, Mr. B., hundreds of dragonflies hovering over the rice fields! The mosquito population was high in cottage country this year, and I saw more dragonflies than ever before but not hundreds! Incredible transition and such great shots! Thanks, Patti. Thanks for stopping by. I didn’t know either, Maggie. Ran a contest in our Lake Association newsletter (I’m the Editor) asking members to identify the Mystery Critter! I was really surprised! Thanks, Margie! I love dragonflies too. They always put me in mind of something ancient, still here for us. This past summer in cottage country they were everywhere … record mosquito population to feast on! Fascinates me too! Truly a wonder. I had no idea that was how a dragonfly began its’ life! Second picture, the wings are awesome. And a huge plus-eats skeeters! 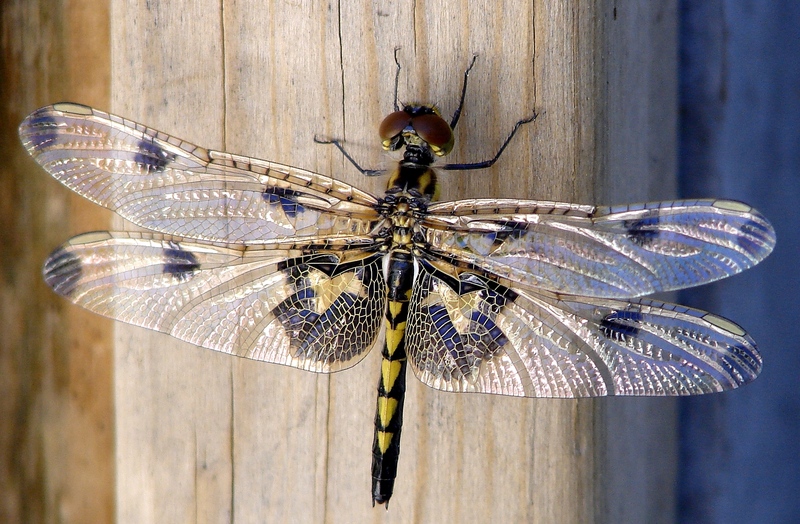 The exoskeleton looks more ‘dragon’ like than the dragonfly. If I had seen this creepy thing hanging in my lilies by the lower deck, I might have reacted in pure fear and sent it flying into the lake. Fortunately, the dragonfly had already emerged when I discovered it. Thanks for the pingback … My first camera was a gift from my grandparents … a Brownie! Two moments nearly a year apart! I discovered the exoskeleton first and found out months later what it was … a mystery critter revealed to be the even more mysterious dragonfly! I always think: how clever constructions! engineers could learn a lot! PING: All I can say is Bravo Cheryl!! Thanks for mentioning my discovery on your blog! Thanks, Fergiemoto … I didn’t have to use any software … it’s wings naturally glisten like that! No way! I had no idea that is how dragonflies came to be!!! That is very cool and amazing! Blew me away too … the natural world is such a mystery … our’s to discover! 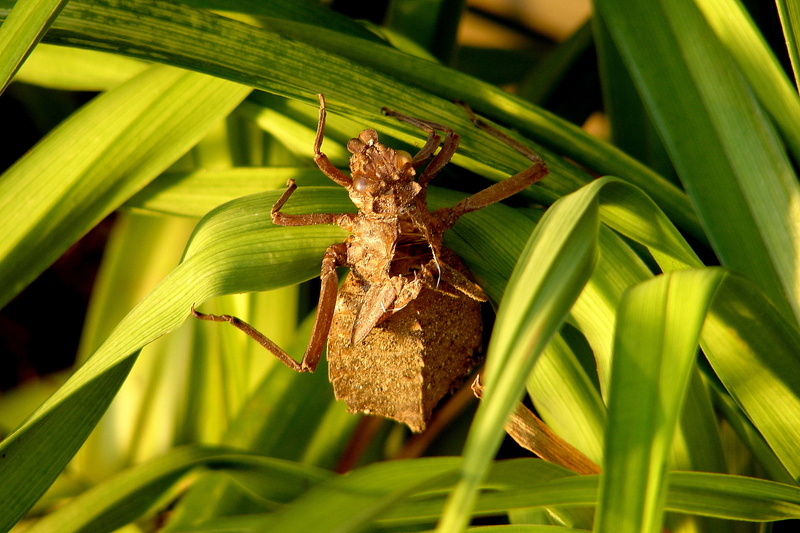 The exoskeleton was discovered first. I didn’t know what it was but it was soooo strange. Posted a contest in our Lake Association newsletter to find out what it was!